Inspectors uncover ground broken for the construction of an illegal route in Judea and Samaria. The David unit of the Civil Administration stopped a truck carrying illegal iron waste during and operation at the Trans-Samaria highway Sunday. Upon inspection, it was discovered that the suspects were attempting to smuggle waste in Judea and Samaria. According to international conventions, the introduction of waste into the Judea and Samaria Area is a violation of the law, as is the illegal dumping of waste at sites not designated for this purpose. In addition, during a patrol of the Civil Administration's supervision unit this morning, inspectors uncovered ground which had been broken for the construction of an illegal route near the village of Qablan. 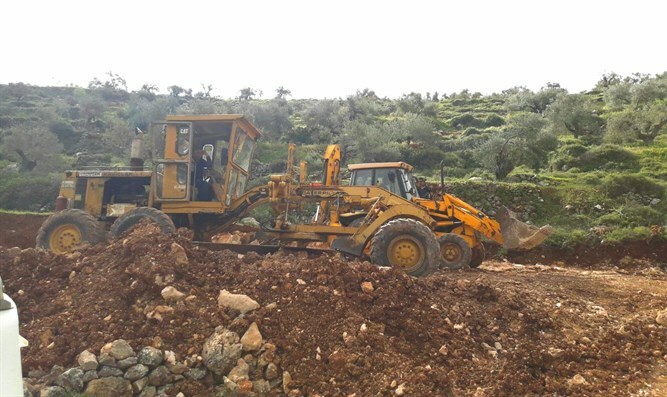 The tools with which the work was carried out to open the route were confiscated by the inspectors present at the site, accompanied by a force and a representative of the Shechem [Nablus] District Coordination and Liaison Office. "We are working diligently to prevent environmental hazards and those who violate the law from continuing their crimes," said the director of the Civil Administration's supervision unit. "We will act to bring to justice anyone who tries to break the law in Judea and Samaria."